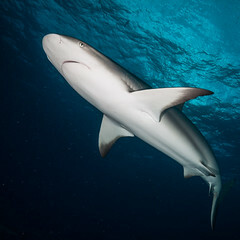 Carolina Hammerhead is a harmless, grey to brown hammerhead shark belong to the family Spyrnidae. Its name – Sphyrna gilberti, commonly named Carolina Hammerhead was discovered by ichthyologist Prof Joe Quattro from University of South caroline and his colleagues when they were studying scalloped hammerhead sharks (Sphyrna lewini). Searching the literature, the scientist found that Dr. Carter Gilbert, has described an anomalous scalloped hammerhead in 1967 that had 10 fewer vertebrae than Sphyrna lewini. It had been caught near Charleston and the team wwas able to examine it morphologically and suggest that it constituted a cryptic species – that is, one that is physically nearly indistinguishable from more common species. Prof Joe Quattro’s team followed up by making thorough measurements of 54 Sphyrna gilberti individuals to fully describe the new species. The Carolina hammerhead strongly resembles its close relative, the Scalloped hammerhead shark. The difference in vertebrae, 10 fewer in Sphyrna gilberti is the defining morphological difference. According to the paper, the 56 specimens of Sphyrna gilberti collected in the coastal waters of South Carolina were juveniles measuring about 40-50 cm long. The estimated adult length is about 3 – 4 m.
“Populations of sharks have greatly diminished over the past few decades. The biomass of scalloped hammerheads off the coast of the eastern U.S. is less than 10 percent of what it was historically,” Prof Quattro said. Shark Diving Indonesia is the first Dive Center operated in Morotai Island, North Mollucas, Indonesia. Shark Diving Indonesia established in 2013 when there were no closest than 500 km to obtain the dive gears and tanks. It is aimed to support local capabilities in both recreational diving, tourism, and natural conservation. Indonesia as one of the countries where shark catch is still exist, should turn its role to the country that supports shark conservation. It's abundancy on sharks - from the small walking shark up to a big whale shark should be kept for generations. Shark Diving Indonesia supports all efforts in shark conservation either locally in Morotai, a nation-wide movement in Indonesia, or other international efforts. Shark Diving Indonesia welcome you to dive with shark and share some of our revenue to local community, in form of diving education, local capacity building, and marine life conservation. Shark Diving Indonesia working closely with other Diving Operators in other area to promote dive tourism and campaign together to promote the tourism as well as diving knowledge.